A. C. Monk and Company was founded in Farmville in 1907 by Albert Coy Monk. Initially, Monk and one assistant bought tobacco and shipped it in hogsheads from the Farmville railroad station. After weathering the panic of 1907, the company flourished by concentrating on foreign markets and steadily grew to become one of the world's largest independent dealers and exporters of flue-cured tobacco. A. C. Monk and Company built a larger warehouse in 1913, replacing an earlier structure purchased in 1907. The company initially packed its product green in hogsheads on the warehouse floor, but subsequently it built a small redrying room and finally a full-scale processing plant on Horne Avenue. In 1933 the company expanded this plant to double its capacity. By the 1980s the company occupied a 55-acre landscaped tract with a processing plant covering 10 acres, and it employed approximately 70 buyers, more than 30 salesmen, and an in-season labor force of approximately 1,000. Its buying organization covered every American tobacco belt, as well as markets in Guatemala, Italy, Brazil, Korea, and Canada, and it sold tobacco throughout the world. To remain competitive, Monk and Company continued to expand, doubling its size in 1990 by acquiring Austin Company, a Greeneville, Tenn.-based tobacco merchant. In November 1992 the Monk-Austin company went public, trading on the New York Stock Exchange, but Monk family members retained more than 70 percent of the shares. In April 1993 the company expanded again by acquiring its joint-venture partner, Centerleaf (Malawi) Limited, and the tobacco division of T. S. Ragsdale Leaf Company of Lake City, S.C. In 1994 the company diversified when Albert C. Monk III forged a merger with Dibrell Brothers of Danville, Va., leading to the creation on 1 Apr. 1995 of DIMON, Inc. The new enterprise, headquartered in Danville, became the world's second-largest leaf tobacco dealer as well as the world's largest importer and exporter of fresh cut flowers. In 1997 DIMON acquired Intabex Holdings Worldwide, S.A., the world's fourth-largest leaf merchant, and in September 1998 it sold its flower business. By 2004 DIMON had more than $1 billion in assets. 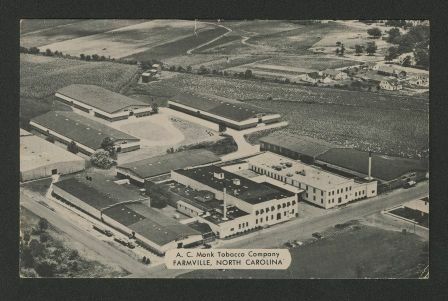 A.C. Monk Tobacco Company, Farmville, North Carolina, c. 1900-1950, id: 318.2.c.351. Available from East Carolina University Libraries Digital Collections. Available from http://digital.lib.ecu.edu/303 (accessed May 3, 2016). 1 January 2006 | McArver, Charles H.